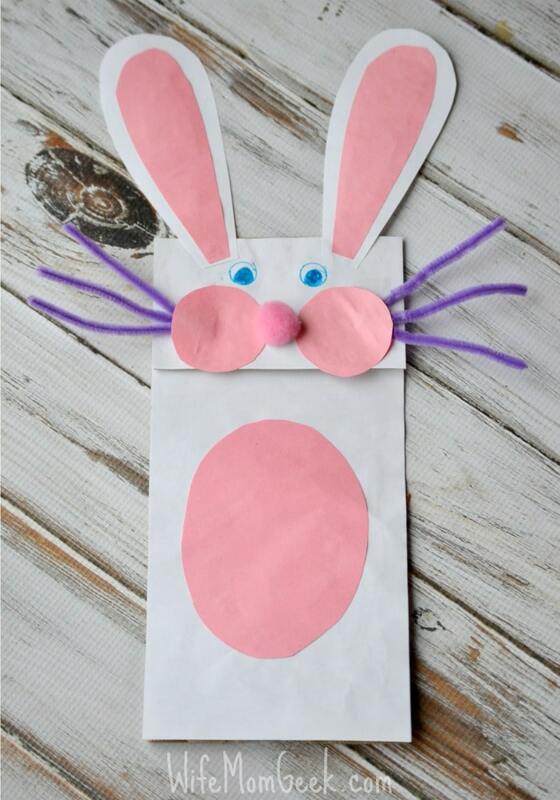 Bunny Paper Bag Puppet - Fun Easter Craft for Kids! My kiddo has been obsessed with the paper bag puppets lately. He asked for the leprechaun paper bag puppet long after it had been thrown in the trash, so I decided that it was time to make one for Easter. And that’s how we arrived at this Easter Bunny paper bag puppet. It’s easy to make, but I included a printable template in case you need it. Don’t laugh too much at my drawing skills; they’re not the best. You can just cut the shapes out with scissors without a template. That’s the easiest way, because you can fold the paper in half and get even shapes on each side. But, if you’re going to let your kids cut the shapes out by themselves, here are the shapes you need for the ears, cheeks and pink belly. Look over that dirty little face, would you? Thanks. Cut the white construction paper to fit the bag. (I didn’t include this in the template because it’s easy enough.) Cut out white ears to make the outer ear. Cut the pink construction paper for the inner ears, cheeks and belly. Use the template above if you need to. Cover the bag in white construction paper using glue. Add the white outer ears first using glue, followed by the pink inner ear. Glue the pink belly in place. Cut each pipe cleaner into thirds to make three whiskers on each side of the face. Tape them into place. Cover up the tape using the pink circles for cheeks. That’s it! You can draw a mouth or some cute buck teeth onto the rabbit if you’d like. I didn’t want to push my luck. My craftiness has its limits. 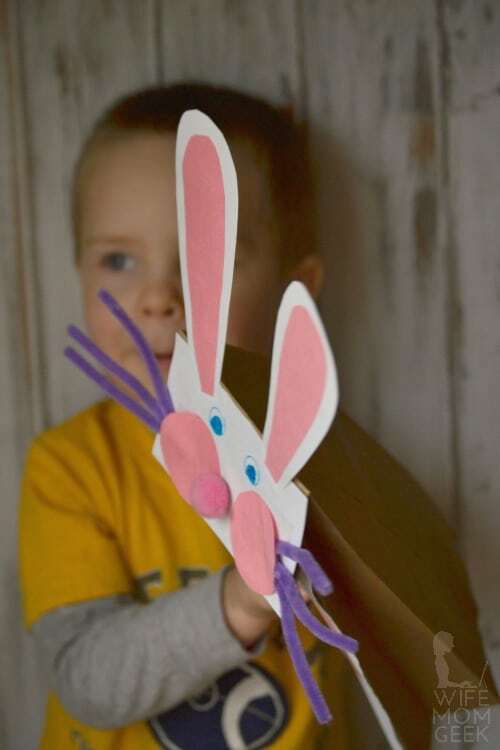 Have you created a fun Easter craft with your kids lately? Share it with us in the comments! If you enjoyed this craft, you’ll love these 10 Easter Sensory Activities and 10 Easter Books for Preschoolers, too. Check them out! 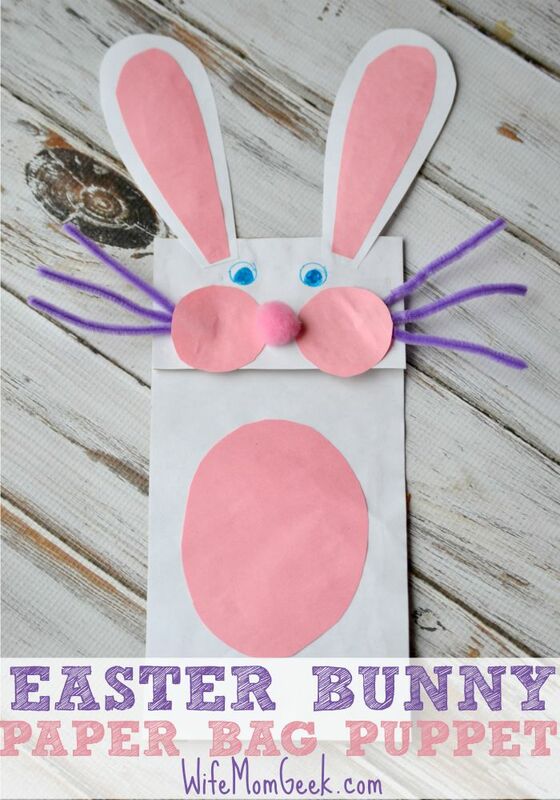 What a creative and fun craft project for kids this Easter! 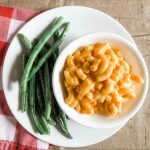 I’m always looking for easy and creative things to do with my kids and can’t wait to try this! I hope your kiddos like it! Saying hello from We Love Weekends… such a cute idea! Will have to try it out with my girls before Easter! Meghan recently posted…My Favorite Spring Tradition: Â¡Cascarones! How cute and what a fun craft idea to share with children! Thanks for sharing on the Spring Craft Blog Hop. Hello! I found you via WE LOVE WEEKENDS linky and I love your site – and your have a similar attitude to crafts as me; I like it but I’m not the best at it but hey, always happy to give it a go! Haha. Exactly! I’m no Martha Stewart, but the kiddo and I have fun trying to make things, anyway. We make do with what we have on hand. LOL Thanks for stopping by. Hope your kids like the bunny bag! These are really cute. I can see my kids playing with these for several hours after they made them. Thank you so much for sharing this idea with us. Oh my goodness, this is adorable! What a simple yet effective Easter bag that the kids will have a blast making. Stopping by from Sunday’s Best over at Mother 2 Mother! LOVE the picture with your son and the puppet! Shared and pinned! 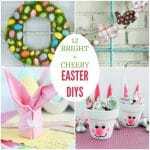 So cute for Easter – Thanks for linking up to Pin Worthy Wednesday, I have pinned your post to the Pin Worthy Wednesday Pinterest Board. This is so cute! My kids love puppets too. Thanks for sharing at What’d You Do This Weekend? I hope you will join us again this Monday! I can imagine children would love to make this, it looks like fun. Thanks for linking up to Sweet and Savoury Sunday, stop by and link up again. Have a great day!! This idea is so adorable. I tend to do a ton of crafts with my 7 year old daughter, but not as many with my 3 year old son. This looks like the perfect project for him. Thanks for including our bunny puppet, Crystal!